Karen Lucchesi attended the University of Texas Arlington and the Academy of Esthetics and Cosmetology. Her experience includes modeling, real estate, salon/spa ownership and the development of total wellness centers. Lucchesi is also the owner of KRL, Inc. and KFL, Inc., where she develops the start-up of professional baseball teams. She is the Vice President of group, which develops minor league baseball teams and stadiums. Nominated for Woman of the Year by Northeast Tarrant County, her spa La Plaza Wellness Center was awarded Business of the Year and featured in the top Spa Magazines in the country as one of the top wellness centers in the USA. Appeared in Glamour, Redbook and Marie Claire magazines. 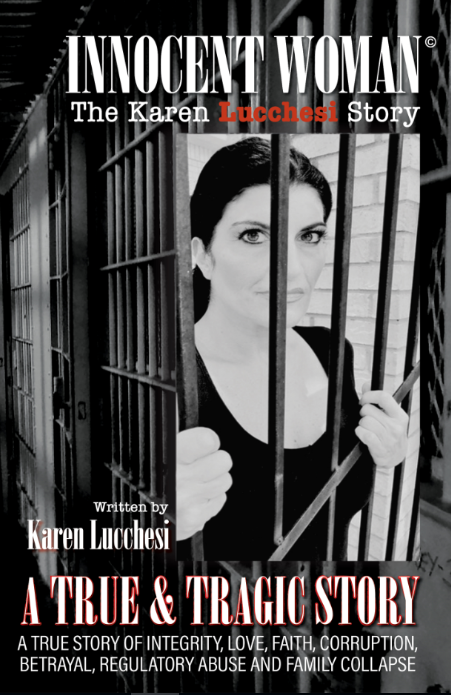 After several successful years, Karen’s life was suddenly turned upside down when A man she called friend, corporate advisor and attorney, Anand Alloju, and his wife, Lisa Alloju, lured by a government agent to perform a sting operation and Karen was framed for $20,000 in a money laundering scheme when she was about to sell La Plaza for $8.4 Million. Do you think you know about the “justice” system? If you said yes, think again. Karen Lucchesi is a multi-award-winning entrepreneur and community leader. In her talks she shares her personal experiences as a successful business owner, debilitating illness, the loss of everything, prison and starting over. Most people wouldn’t have any reason to keep going, but Karen is passionate about sharing with her audiences the formula of Success. Determination, Faith and Choice. She will Awe, Motivate, Encourage and Inspire! Karen Lucchesi frequently appears on several America talk and news radio programs. Karen is co-host on Secrets of Successful Women radio, encouraging women to keep growing and never quit on your dreams. Karen has fought and wins the daily battle with Lupus and is a passionate supporter of our community, art and fundraising for charity. Aside from being a successful woman and business leader, Karen is an exemplary human being. Warm, thoughtful, funny and smart all while somehow being as tenacious and tough as a woman in the baseball business. The Supreme Court of the United States vacated her sentence. A Crooked Attorney and a FOOL for a Judge did their best to ruin her. In spite of everything lost, she moves forward. 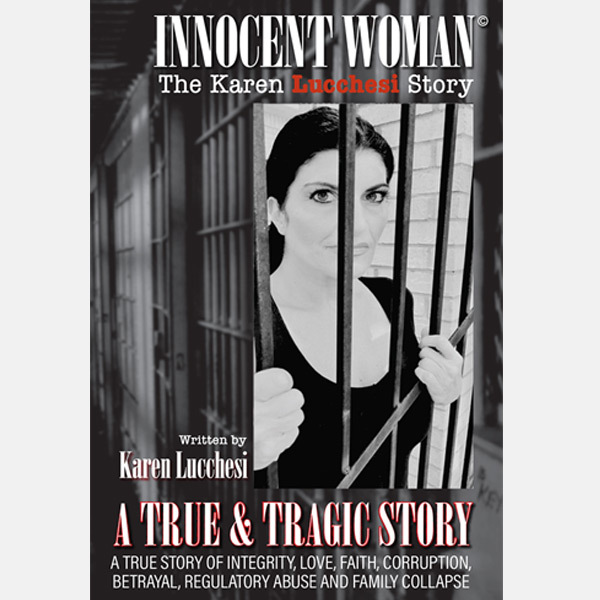 Read some about her, Karen Lucchesi is a force that deserves respect and appreciation. Any organization would be fortunate to have her on their team. 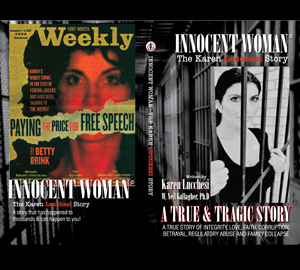 The stories described in Innocent Woman, The Karen Lucchesi Story, were borne of personal experience and re-created from memory. This story needs to be heard, not just because of my case, but for thousands who have suffered along with their families, as I have, and everyone who has ever been affected. This is a raw and real-world story. I was framed for laundering money. My choices? Take a plea deal for probation or up to six months in jail, or go to trial and face up to 10 years in prison. What would you do? 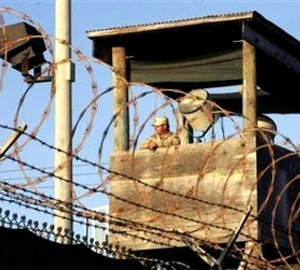 I believed that Americans were innocent until proven guilty, but are we merely guilty until proven innocent? And, will you REALLY be given a chance to prove your innocence if you are ever charged with a crime?